Enterprise & Society offers a forum for research on the historical relations between businesses and their larger political, cultural, institutional, social, and economic contexts. The journal aims to be truly international in scope. In the 1960s, Coca-Cola had a cocaine problem. This might seem odd, since the company removed cocaine from its formula around 1903, bowing to Jim Crow fears that the drug was contributing to black crime in the South. But even though Coke went cocaine-free in the Progressive Era, it continued to purchase coca leaves from Peru, removing the cocaine from the leaves but keeping what was left over as a flavoring extract. By the end of the twentieth century it was the single largest purchaser of legally imported coca leaves in the United States. Yet, in the 1960s, Coke feared that an international counternarcotics crackdown on cocaine would jeopardize their secret trade with Peruvian cocaleros, so they did a smart thing: they began growing coca in the United States. With the help of the US government, a New Jersey chemical firm, and the University of Hawaii, Coca-Cola launched a covert coca operation on the island of Kauai. In 1965, growers in the Pacific paradise reported over 100 shrubs in cultivation. How did this bizarre Hawaiian coca operation come to be? How, in short, did Coca-Cola become the only legal buyer of coca produced on US soil? The answer, I discovered, had to do with the company’s secret formula: not its unique recipe, but its peculiar business strategy for making money—what I call Coca-Cola capitalism. What made Coke one of the most profitable firms of the twentieth century was its deftness in forming partnerships with private and public sector partners that helped the company acquire raw materials it needed at low cost. Coca-Cola was never really in the business of making stuff; it simply positioned itself as a kind of commodity broker, channeling ecological capital between producers and distributors, generating profits off the transaction. It thrived by making friends, both in government and in the private sector, friends that built the physical infrastructure and technological systems that produced and transported the cheap commodities needed for mass-marketing growth. In the case of coca leaf, Coca-Cola had the Stepan chemical company of Maywood, New Jersey, which was responsible for handling Coke’s coca trade and “decocainizing” leaves used for flavoring extract (the leftover cocaine was ultimately sold to pharmaceutical firms for medicinal purposes). What Coke liked about its relationship with Stepan was that it kept the soft drink firm out of the limelight, obfuscating its connection to a pesky and tabooed narcotics trade. But Stepan was just part of the procurement puzzle. The Federal Bureau of Narcotics (FBN) also played a pivotal role in this trade. Besides helping to pilot a Hawaiian coca farm, the US counternarcotics agency negotiated deals with the Peruvian government to ensure that Coke maintained access to coca supplies. The FBN and its successor agencies did this even while initiating coca eradication programs, tearing up shrubs in certain parts of the Andes in an attempt to cut off cocaine supply channels. By the 1960s, coca was becoming an enemy of the state, but only if it was not destined for Coke. In short, Coca-Cola—a company many today consider a paragon of free-market capitalism—relied on the federal government to get what it wanted. An old Coca-Cola bottling plant showing some of the municipal pipes that these bottlers tapped into. Courtesy of Robert W. Woodruff Papers, Manuscript, Archives, and Rare Book Library, Emory University. Coke’s public partnerships extended to other ingredients. Take water, for example. 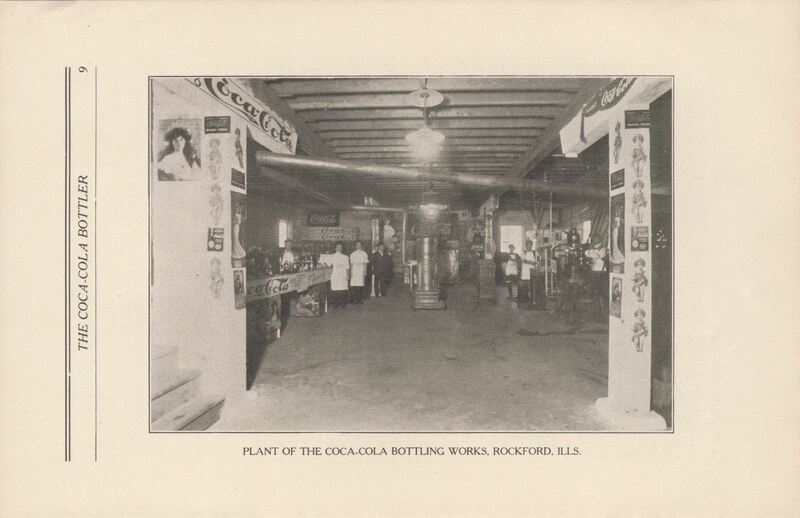 For decades, the Coca-Cola Company relied on hundreds of independently owned bottlers (over 1,000 in 1920 alone) to market its products to consumers. Most of these bottlers simply tapped into the tap to satiate Coke’s corporate thirst, connecting company piping to established public water systems that were in large part built and maintained by municipal governments. The story was much the same for packaging materials. Beginning in the 1980s, Coca-Cola benefited substantially from the development of curbside recycling systems paid for by taxpayers. Corporations welcomed the government handout, because it allowed them to expand their packaging production without taking on more costs. For years, environmental activists had called on beverage companies to clean up their waste. In fact, in 1970, 22 US congressmen supported a bill that would have banned the sale of nonreturnable beverage containers in the United States. But Congress, urged on by corporate lobbyists, abandoned the plan in favor of recycling programs paid for by the public. In the end, Coke and its industry partners were direct beneficiaries of the intervention, utilizing scrap metal and recycled plastic that was conveniently brought to them courtesy of municipal reclamation programs. In all these interwoven ingredient stories there was one common thread: Coke’s commitment to outsourcing and franchising. The company consistently sought a lean corporate structure, eschewing vertical integration whenever possible. All it did was sell a concentrated syrup of repackaged cheap commodities. It did not own sugar plantations in Cuba (as the Hershey Chocolate Company did), coca farms in Peru, or caffeine processing plants in New Jersey, and by not owning these assets, the company remained nimble throughout its corporate life. It found creative ways to tap into pipes, plantations, and plants managed by governments and other businesses. In the end, Coca-Cola realized that it could do more by doing less, extending its corporate reach, both on the frontend and backend of its business, by letting other firms and independent bottlers take on the risky and sometimes unprofitable tasks of producing cheap commodities and transporting them to consumers. This strategy for doing business I have called Coca-Cola capitalism, so-named because Coke modeled it particularly well, but there were many other businesses, in fact some of the most profitable of our time, that followed similar paths to big profits. Software firms, for example, which sell a kind of information concentrate, have made big bucks by outsourcing raw material procurement responsibilities. Fast food chains, internet businesses, and securities firms—titans of twenty-first century business—have all demonstrated similar proclivities towards the Coke model of doing business. Thus, as we look to the future, we would do well to examine why Coca-Cola capitalism has become so popular in the past several decades. Scholars have begun to debate the causes of a recent trend toward vertical disintegration, and while there are undoubtedly many causes for this shift, it seems ecological realities need to be further investigated. After all, one of the reasons Coke chose not to own commodity production businesses was because they were both economically and ecologically unsustainable over the long term. Might other firms’ divestment from productive industries tied to the land be symptomatic of larger environmental problems associated with extending already stressed commodity networks? This is a question we must answer as we consider the prudence of expanding our current brand of corporate capitalism in the years ahead. Bart Elmore is an assistant professor of global environmental history at the University of Alabama. He is the author of "Citizen Coke: An Environmental and Political History of the Coca-Cola Company" (available to read for free for a limited time) in Enterprise and Society. His forthcoming book, Citizen Coke: The Making of Coca-Cola Capitalism, is due out with W. W. Norton in November of 2014. I wonder if we know that why children are allowed to be the best consumers and which will be the consequences of a massive con su e???? Ah, the article is…vertically stressed in the argument it makes. Such a drab reminder that business can take many forms more exciting than the words here.